I quite often get asked how I take my award winning photos. People ask me about my equipment (I guess the secret to great photography is the camera!) or they might ask if there are any tips for composition, lighting, models or any number of technical details. All of these things play a role in a great image. However, the key ingredient is paying attention to how you see the world. A million points of focus pass our eyes in any given minute, of any given day. Its up to us to decide what to focus on. Many new and even some veteran photographers, get caught up in the technical details of creating a photo. Yet some of the greatest photos of all time were created with rather basic equipment with natural light and by relatively inexperienced photographers. Some of Annie Leibowitz’s greatest works with musicians in the 70’s and 80’s where done at a time when she (self professed) knew very little about cameras or photography. Shooting with just a basic Nikon on black and white film like any amateur – yet magic happened. Why? Because Annie, like other greats, are keen observers of their world. So how do we get better at seeing the world. Given I am primarily a people photographer, I will start there. First, observe behaviour. Don’t drag out the camera and start firing, whether you are in the studio or on location. 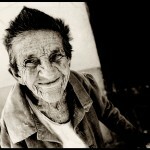 Take some time to observe and even interact with people you may want to photograph. In a formal shoot like a fashion campaign or a corporate head shot, I always take some time to get to know the model. Sure chatting helps to put them at ease, but what I am really doing is watching how they move, their facial expressions and any kind of distinctive or signature look they may have. These small observations help me craft the look that differentiates and defines the final image. When shooting landscapes or people in a setting, take some time to walk the environment and see it from many different perspectives. Even if a client says I want this person standing in front of this building from this angle, I find that almost 100% of the time if I really look at the scene before I put a viewfinder to my face, I find a better way of capturing what I, or the client, is striving for. And don’t be afraid to go to some lengths to really see the space. Lay down on the floor, stand on a ladder, pull back, move in. Once you put the camera to your face and see the world through that familiar geometric border, test the perspectives that appealed to you and take some test shots and compare. Try selective focus to inspire the viewer to experience what you felt in the moment of capture. Try defocus as this can also set a tone or mood that captures what you experienced in the space.